The fifth and final race in the 2013 SUPSA National Race Tour was held at Germiston Lake, Johannesburg on the 7th of Sept. The Germiston Lake area was populated in the hey-days of gold-mining and rumour has it it still packs plenty of gold and other minerals below the heavy weeds that have now made weed fins compulsory equipment for paddlers. Germiston is sitting at 1600 meters (5,200 feet) altitude, so the air is somewhat thinner than down at the coast, which would take its toll on the visitors from the coast. The region is also extremely dry this time of year – the locals claim it’s drier than Kimi Raikonnen’s humour and that even the camels left for Sahara some time back… The air temp was 25 degrees celsius with virtually no wind, or in other words:perfect flatwater racing conditions. Cape Town was represented by 6 paddlers while Durban had sent up Shelley Bradfield to do battle. Jo’burg managed to line up only 10 paddlers up for their first ever, national race event… SUP’ing still has some way to go on the highveld. The course was set at 4x laps of an exact 3km course at the outer perimeter of the lake – so 12kms in total – passing a unique sprouting water feature which created a welcome relief on each lap. The rest of the course had the paddlers passing a park, a golf-course and a bunch of fishermen whose lines had to be negotiated with bunny-hops by the lead pack on the first lap! Dylan Frick and Ethan Koopmans were sitting one and two in the champs coming into this race, as were Brigette van Aswegen and Shelley Bradfield, so all eyes were on these battles. Dylan, as per usual, blitzed off the start with local heroes Anton Nel and Gunter Berger also getting off the line well. A front train of 5 paddlers quickly developed with Dylan, Ethan, Anton, Gunter and Peter P pulling away from the rest of the field. Brigette was pulling Shelley and it was a true cat and mouse game with little wind ruffling the surface in parts of the lake. It was all drafting with Dylan speeding up occasionally to show who was boss and the pack exchanging positions every now and again. Shelley made her move on Brigette on the 3rd lap and managed to get a gap right away. The lead train in the men’s division continued to keep the pace around 9km/h with Dylan controlling proceedings and never giving an inch. 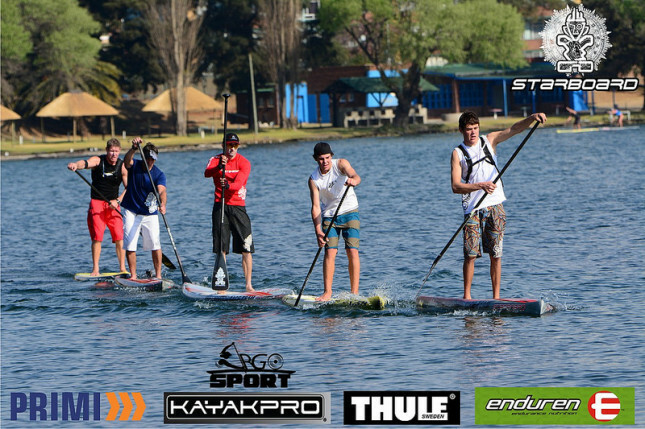 Ethan tried to challenge on the final sprint but Dylan had left sufficient energy in the tank to take a deserved win and the 2013 South Africa National SUP race title. Surprise package was Gunter Berger who stuck with the lead two to take a fine 3rd. Shelley had steadily pulled away from Brigette to finish well clear and to secure the ladies SA National race title, while 15yo Mishka Steyn fought bravely to come in 3rd. The result puts Dylan, Ethan and Shelley in line for selection for next years ISA Worlds in Nicaragua – they were all looking strong and seeing they are all still developing race by race we expect great things from them. All the coastal paddlers reported tough breathing and at the prizegiving you’d hear casual coughing from all of them as the dry, oxygen depleted air, was getting the better of them. South African SUP racing has come a long way since our first national series 4 years ago where about 15 paddlers took part – this year sees close to 70 paddlers having vied for points, and with the inclusion of Johannesburg, the tour has gone inland and become truly national.